In the 1980s, Israel weapons traders gave the Duvalier Tonton Makouts, Uzis. In the 2000s, they provided the oligarchy with Galil assault weapons to create Gang Galil. Today, they ramp up with bioterrorism tanks, filled with crowd controlled deadly toxic water as a weapon of colonial oppression. A few days ago, Haiti students peacefully demonstrated against the fascism at the State University. The occupiers, led by the US through the UN-charity humanitarian front, said nothing as their trained henchmen, used chemical weapons on them. Who will invade to stop the UN Security Council and the US-Eurasian-Zionist from the chemical weapons attacks on Haiti’s unarmed civilian population? 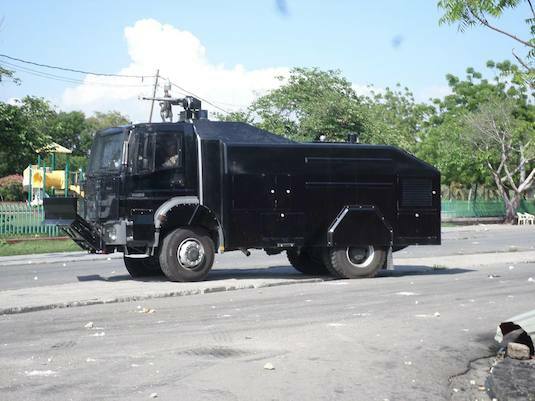 The civilized nations sent their brutal, US-Euro-UN-trained and militarized police – the newest internationally financed Tonton Makouts militia in Haiti- to deny the peaceful protestors constitutionally guaranteed rights to freedom of speech, expression and peaceful civil disobedience. This is obviously a crime. But, the UN Security council is made up of the most powerful nations on the planet – US, France, England, China and Russia. Their leaders are the people responsible for this international travesty in Haiti — for the sanctioned US occupation behind UN mercenary guns, rigged elections and the false benevolence of the NGhoe charitable industrial complex. The five are the respondiat superior – the complicit war criminals who yearly renew their vote for the UN-MINUSTAH occupation and now in Oct 2017 for MINUJUST (aka the UN minus justice). It’s purchased by the self-styled “Friends of Haiti” countries committing war crimes and genocide for political gain and personal profit of the transnational corporations. Water cannon trucks spraying toxins, along with UN-imported cholera, regularly pollutes Haiti underground and surface water. Gifts from Israel and the Obama-Bush-Clinton “Friends of Haiti” governments, routinely and with impunity, blast protesters, students and workers demanding workers rights with pepper gas, toxic green water dye and other chemicals which causes first degree burns and painful, burning skin rashes. Tear gas and colored fluid hurled from high speeds water cannon are devastating to eyes, skin, throat, heart, lung and respiration. Numerous Haitian children and babies are killed per year. Already famine-stricken and traumatized youths and adults get maimed. Tear gas is prohibited in warfare. There’s a chapter 7 shoot to kill UN-MINUSTAH war mission still in Haiti. But it seems chemical warfare can readily be used on Haiti workers, babies, bystanders, and students who are peacefully protesting terrible conditions at the university or, for justice for Goug, a classmate. The latest student sit-in at Kafou Tijou, was also to demand justice because at another peaceful sit-down last month, the Dean of the University, Jean Yves Blot, ran his car over Goug and fled the scene. Here is another video showing the use of the toxic water cannon, on April 7, 2014, on mere Haiti schoolgirls not even involved in the university student protest, but just walking home from school. The Chemical Weapons Convention bans the development, production, acquisition, stockpiling, retention, transfer or use of chemical weapons. Tear gas is a blister and choking agent that burns the eyes, mouth, throat, skin and can cause permanent lung damage when the gas is inhaled. Tear gas qualifies under the Chemical Weapons Convention as a chemical weapon. There is arguably an exception for the US to use tear gas in a limited number of contexts, such as for controlling a riot at a prisoner-of-war detention area. But it’s against both the Haitian constitution, the US constitution and international law to deny peaceful protests and the exercise of fundamental human rights, including freedom of speech and peaceful political expression. Who will invade to stop the UN Security Council nations, the US-Eurasian-OAS-AU nations and Zionists in Haiti from the chemical weapons attacks regularly unleashed – through their local militarized police – on Haiti’s unarmed civilian population and children? “What’s concerning is the Tear gas or Pepper Spray levels added into the water stream can be varied in concentration by the water cannon controller. This could have dire consequences if delivered to strongly.